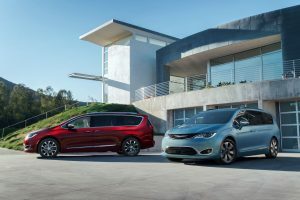 When Chrysler introduced the Pacifica, I thought it was one of the best, if not the best-looking minivans in production. Well it’s not only the best looking, it’s also the best minivan, period. The whole idea of plug-in hybrid just didn’t quite make sense to me. Is it a hybrid or not? 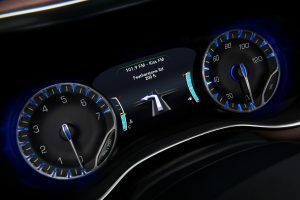 Since driving this latest version of the Pacifica, I get it now. With 33 miles electric-only range, this is a wonderful vehicle to drive regardless that it’s a minivan. There is a magic carpet-like quality to driving those 1st 40 miles on e-juice only. Then there is a seamless “joint venture” between electric motors and the V6 gasoline engine that for the driver, it’s a completely unnoticeable affair. From the outside, there are three subtle differences from the regular gas-powered model are: The left front access door for the pug in port, the unique styling of the wheels and the rear hybrid badge. Inside the difference is less storage capacity due to the large battery bank that is below the second row of seats. This takes away what Chrysler calls “Stow ‘n Go” capability for these seats. Regardless, this is an acceptable small price to pay to get the effortless driving quality the Pacifica plug-in hybrid offers. During my week with the Pacifica, I had the opportunity to test-drive a six figure Asian GT car at the same time. I did drive it, but I kept on wanting to drive the Pacifica more. Really? A world class GT car vs. the Pacifica? Yes! Believe it or not. What an active week it was. From taking the family out to dinner several times, transporting an exhaust stack for my vintage Piper Super Cub airplane, to buying and moving an eight-foot Christmas tree, which by the way, fits quite easily inside the cabin instead of looking foolish having to put the tree on the roof and having it get all distorted with the wind while driving home. 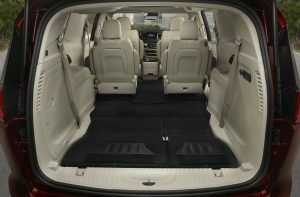 Inside, the Pacifica is world class. Fit and finish are an unexpected pleasant surprise. Controls and switch-gear feel strong and precise. 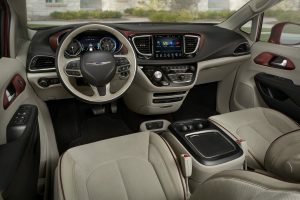 There is a first class feel to the interior overall. 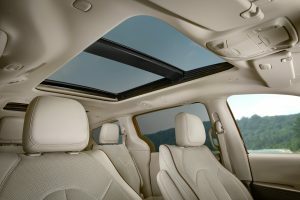 The multiple storage spaces, the presentation of the instrument dash as well as the comfort of the seats makes for a top-quality experience. Second row captain chairs both have individual entertainment screens and headphones. Third row seating is surprisingly comfortable with good ventilation and access. So how does it drive? Apart from the magic carpet ride during the electric only portion, there is good power from the V6. I even put it through my sweeping left handed turn test and it was remarkably compliant, I’d have to say, almost sporty! Interesting, that for me when I drive a hybrid I immediately become as efficient as possible with the acceleration, coasting and braking. This gave me a pretty good fuel economy score overall. I used the car over 400 miles and almost half was considered electric mode. Yes, there is a handy dandy sub-menu on the dash that tells you that. 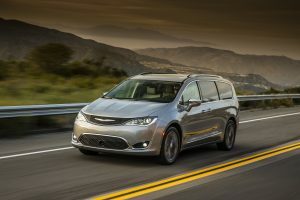 I don’t see the point of thinking a similar sized SUV or crossover when the Pacifica gives you everything these offer plus more. Price is $2,100.00 higher than the premium model version but the $7,500.00 Federal tax credit will put you in a price point less than the top-trim model. Was I wowed? You bet I was. Gorgeous design, great interior and excellent driving dynamics. What’s not to like? Come on, let’s make Minivans cool again. ← The Civic Si coupe, it’s all grown up!